Travellers in Kyrgyzstan are charmed by the blue architectural details of Kyrgyz homes: marvellous hues adorn shutters, doors, gates and windows. Often the paint has faded - nevertheless, the charm remains, particularly on the gingerbread cottages dotted throughout the countryside. 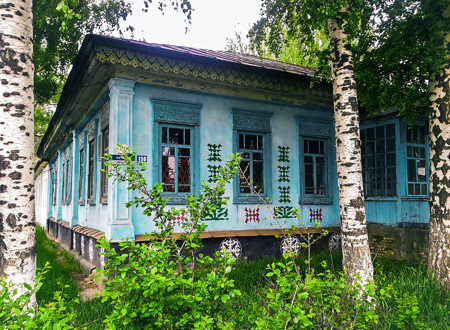 Discussing this with Lilya Kas'janova, the brilliant guide who leads Uzbek Journeys tours in Kyrgyzstan, there are many theories about why blue is so popular. As always, Lilya dazzled me with her knowledge of Kyrgyz traditions. (However, I hasten to add that theory #11 below was contributed by a mad Kyrgyz taxi driver). 1. 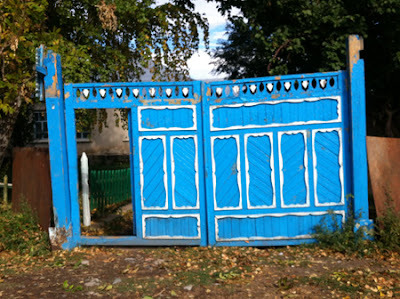 Blue represents the boundless sky of Kyrgyzstan. 2. 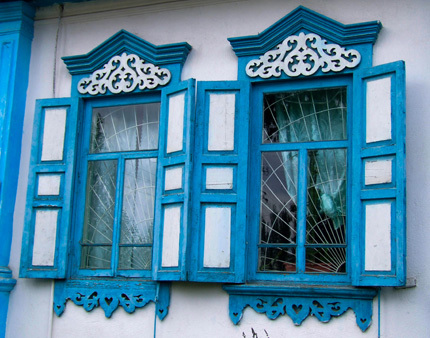 Blue also represents water - Kyrgyzstan's bright, blue lakes and the swift-flowing, crystal-clean mountain rivers. 3. Blue is considered a symbol of eternity: the colour is attributed to the Sky God in Kyrgyz folklore. 4. 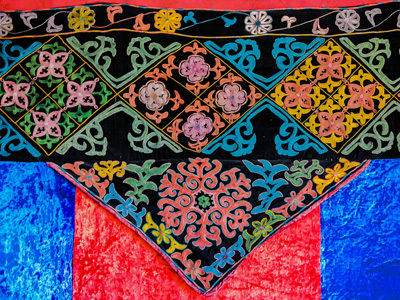 Kyrgyz people are of Turkic stock and in Turkic culture, blue is a symbol of the deity Tengri. Tengriism, a religion of ancient Turkic and Mongol tribes, arose at the end of the 2nd century B.C. Adherents believed that the universe consisted of three parts: the upper, middle, and lower worlds. Blue was associated with the upper world, the realm of the gods. 5. 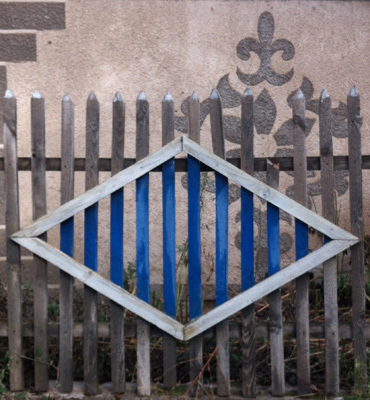 In Mongolian and Kazakh cultures, blue is identified with fidelity and selfless devotion to one's country. 6. In the Middle Ages, blue became associated with veracity and people who dressed in blue clothing were those who sought, and arrived at, the truth. 7. People of the East believe that blue frightens away evil spirits - it protects against evil curses and the evil eye. 8. Manas, Kyrgyzstan's legendary national hero, had a blue flag when going into battle. After victory, the flag was red. 9. In southern Kyrgyzstan, women wear either a blue scarf or dress for one year following the funeral of close family members. 10. 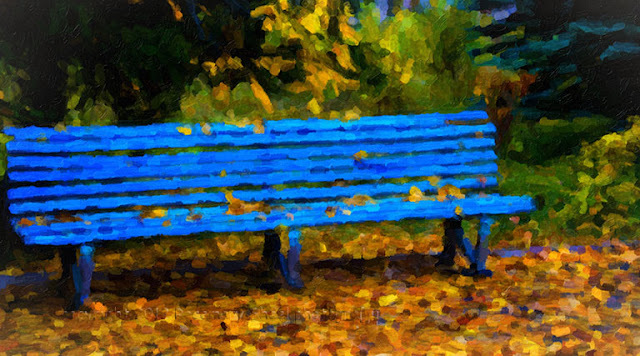 In the Soviet era, the range of cheerful paints was limited - blue was the brightest available. People liked the effect and continue the tradition. 11. This is the alternative Soviet era theory. Yes, the range of paint colours was severely limited in the USSR. However, for some reason, Kyrgyzstan drew the "blue paint" straw and vast amounts were trucked from Moscow to Kyrgyzstan and distributed around the country for residential purposes. Whatever the reason, you will be charmed. 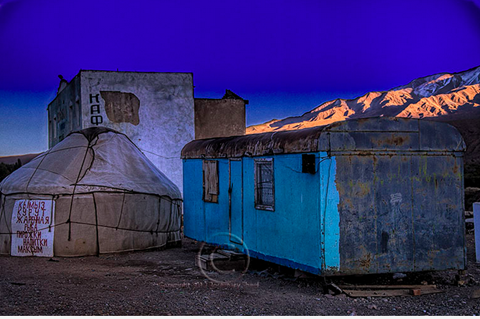 Enjoy several other Kyrgyz "blue" images below.